How to Find Last Account Activity in Gmail ? Do you want to know from where or from which IP address your Gmail id or mailbox has been accessed recently ? or Do you feel that someone hacked into your Gmail ID ? then here is the solution "Last account activity" feature in Gmail. 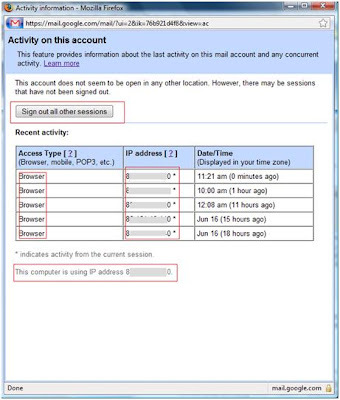 This option shows you details about recent activity in you mailbox including time and date of access,access type like Browser, mobile, POP3, etc . You can find this option at the bottom of Gmail Mailbox. Click on "Details" link to get the information. This feature shows details of current sessions from other IP addresses/sources other than your current system/IP. "Sign out all other sessions" option allows your to terminate all other sessions or login to you Gmail iD. This information is useful.. I never noticed that 'Details' link..